Isles Of Collier Preserve Homes: Why wait for the Builder to work on permits and build if you can own this beauty right now? All the advantages of a new construction without the price! Tastefully upgraded villa, with southern exposure and lovely lake view from the spacious lanai with integrated gas grill! Crown molding features throughout this home with a built-in security system and full WIFI coverage (including on the lanai!). Quartz counters in the kitchen and bathrooms and plantation shutters all over. Hurricane-impact windows and doors, porcelain tile in living area and kitchen, built-in cabinets in master closet, epoxy floor in the garage. This is your opportunity to own in the wonderful community of Isles of Collier Preserve, with its numerous amenities available to all residents and its competitive fees and taxes! Stroll down the street to the Isles Club to play tennis, work out, relax by the resort-style swimming pool, or take to the water from the kayak launch to explore the Cypress Waterway and 8 miles of scenic waters. Attention of all pickleball lovers: East Naples Community Park with over 40 courts, where US Open Pickleball Tournaments are played, is within just a short driving distance. Isles Of Collier Preserve Homes: Be immersed in your own paradise oasis when you enter the stylish front doors of this elegant waterfront estate residence. Grand architecture of this Cocoplum floor plan provides you with 4 bedrooms, 4.5 baths, great room, dining room, study, covered lanai and attached 3 car garage. The outdoor living area allows the interior living spaces to blend harmoniously with the exterior space, so relax around your outdoor fireplace and outdoor summer kitchen or take a swim in your heated pool and spa with water features overlooking the waterway. This coastal casual-living home has an abundance of natural light throughout. Come alive as this floor plan is conducive to entertaining, with multiple living spaces perfect for gatherings of family and friends, the open and inviting great room adjoins the kitchen. The incredible master wing offers sitting area complete with his and hers walk-in closets. Nestled within a pristine setting, Isles of Collier Preserve. The Isles Club consists of classic old Florida clubhouse, fitness center, resort style pool, tennis & pickleball, plus 8 miles of hiking and biking trails, two kayak launches, paddle board, catch and release fishing. This is perfection. Isles Of Collier Preserve Homes: Get ready to step inside the most beautiful home in The Isles of Collier Preserve! A stunning Key West style residence offers 4 bedrooms, 3.5 baths and a HUGE den! The home boasts beautiful custom wood flooring, striking architectural details, 16' ceilings and dramatic lighting inside & out. The open concept great room kitchen and formal dining room are perfect to host gatherings in style. The over-sized master suite offers a sitting area and a luxury bath w/walk-in shower and soaking tub. Two of the 3 guest suites are complete with their own baths and walk in closets. You'll love the oversized screened lanai w/outdoor kitchen, custom pool & spa, multi-level sundeck, outdoor dining and living rooms w/multiple water and fire features. Check out the photos! The Isles of Collier Preserve has it ALL ... Location to downtown 5th Avenue South, miles of walking and biking trails, a resort pool, beach cabanas, state-of-the-art gym, tennis, world class pickleball, kayaking AND the newly opened Overlook Bar & Grill. ~Don't forget you can join the near-by Windstar Country Club for golfing or Hamilton Harbor for boating! This is the Naples lifestyle you deserve! Isles Of Collier Preserve Homes: Don't miss this opportunity to move in for season and relax into the Naples lifestyle. Extraordinary architecture showcases dramatic rooms in this gorgeous lakefront home with spectacular water views. Lake View is on the west side, from the lanai....providing some great sunsets! The Pool View is on the south side & west side, from the interior courtyard...providing abundant light. Floor-to-ceiling sliding glass doors and numerous transom windows throughout infuse the interiors with ever-changing daylight from sunrise to sunset. With all the sliders open, the kitchen and great room transform into an impressive outdoor courtyard, ideal for entertaining. The desirable Papyrus floor plan offers 3,218 square feet under air and 4,938 of the total build including a separate Cabana with a generously sized guest suite overlooking the lake. A paved courtyard driveway accesses a three-car garage with extra storage. The Isles of Collier Preserve enjoys a serene environment with 1,300 acres of undeveloped preserve and waterways. Abundant amenities include paved nature trails, kayak launches, sports courts, fitness and clubhouse with lap and resort-style pools. Isles Of Collier Preserve Homes: Start living the Naples lifestyle today. Custom, Custom, Custom This Plumeria model boasts spacious rooms, soaring volume ceilings, beautiful crown moldings & trim work. Impact resistant windows, custom window treatments. Custom wood like plank vinyl floors of the highest quality and craftsmanship. Gourmet kitchen, large center island and granite counter tops opens onto a large open family room with a custom built in wall unit and lake views. Serenity is found with the tranquil lake view from the elegant master bedroom with his & her walk in closets. Private interior courtyard patio and salt water pool & spa for outdoor easy entertaining. Covered seating, custom stone gas fireplace , gas grill and kitchen. The 3rd bedroom/ guest casita opens onto the pool area. 3-car garage. The Isles of Collier Preserve offers a resort lifestyle 10 minutes to downtown Naples. Over half of 2,400 acres are dedicated to lakes and natural habitat. Clubhouse, Fitness Center, Pool, Tennis & Pickle ball, hiking & biking trails, kayak, paddle board & fishing. Social director, activities and events for year-round fun and entertainment. Coming soon, the Overlook Bar and Grill! Isles Of Collier Preserve Homes: Call this home and start living the Florida lifestyle In Isles of Collier Preserve! Well-appointed award-winning Jasmine Grande plan with SE exposure & glorious lake views. Gourmet kitchen with large center island, quartz counters complimented by contemporary glass backsplash. Entertaining is a delight with this open floor plan, soaring ceilings, large master bedroom/bath suite with custom his & hers closets. Neutral decor throughout, professional window treatments, electric shades, coastal wood floors, surround sound entertainment, and abundant moldings and trim. A must see today! Isles Of Collier Preserve Homes: **$30,000 buyer incentive for a limited time! ** ***Photos are of model, not home being sold. *** Beautiful Minto Jasmine Grande floorplan. Nestled within a pristine natural setting, The Isles of Collier Preserve captures the timeless architecture and traditions of Old Naples. Over half of 2,400 acres are dedicated to lakes, nature preserves and natural habitat. Elegant single-family, villa and coach homes overlook miles of scenic kayak and biking trails along the tranquil Cypress Waterway. Visit our interactive Discovery Sales Center and experience this one-of-a-kind community for yourself! The Isles Club: Classic Old Florida Clubhouse • Fitness Center Resort-Style Pool, Tennis, Pickle Ball, Hiking & Biking Trails, Two Kayak Launches and 8 Miles of Kayak, Paddle Board, Catch & Release Fishing. Come explore our nature trails and waterways on Minto bicycles and kayaks! OVERLOOK BAR & GRILL NOW OPEN! Isles Of Collier Preserve Homes: **$50,000 buyer incentive for a limited time! ** ***Photos are of model, not home being sold. *** Beautiful Minto Camellia floorplan with stunning lakeview! Nestled within a pristine natural setting, The Isles of Collier Preserve captures the timeless architecture and traditions of Old Naples. Over half of 2,400 acres are dedicated to lakes, nature preserves and natural habitat. Elegant single-family, villa and coach homes overlook miles of scenic kayak and biking trails along the tranquil Cypress Waterway. Visit our interactive Discovery Sales Center and experience this one-of-a-kind community for yourself! The Isles Club: Classic Old Florida Clubhouse • Fitness Center Resort-Style Pool, Tennis, Pickle Ball, Hiking & Biking Trails, Two Kayak Launches and 8 Miles of Kayak, Paddle Board, Catch & Release Fishing. Come explore our nature trails and waterways on Minto bicycles and kayaks! OVERLOOK BAR & GRILL coming soon! Home will be ready February/March 2019. Isles Of Collier Preserve Homes: **$30,000 buyer incentive for a limited time! ** ***Photos are of model, not home being sold. *** Beautiful Minto Pimento floorplan. Nestled within a pristine natural setting, The Isles of Collier Preserve captures the timeless architecture and traditions of Old Naples. Over half of 2,400 acres are dedicated to lakes, nature preserves and natural habitat. Elegant single-family, villa and coach homes overlook miles of scenic kayak and biking trails along the tranquil Cypress Waterway. Visit our interactive Discovery Sales Center and experience this one-of-a-kind community for yourself! The Isles Club: Classic Old Florida Clubhouse • Fitness Center Resort-Style Pool, Tennis, Pickle Ball, Hiking & Biking Trails, Two Kayak Launches and 8 Miles of Kayak, Paddle Board, Catch & Release Fishing. Come explore our nature trails and waterways on Minto bicycles and kayaks! OVERLOOK BAR & GRILL NOW OPEN! Isles Of Collier Preserve Homes: **$30,000 buyer incentive for a limited time! ** ***Photos are of model, not home being sold. *** Beautiful Minto Gardenia floorplan. Nestled within a pristine natural setting, The Isles of Collier Preserve captures the timeless architecture and traditions of Old Naples. Over half of 2,400 acres are dedicated to lakes, nature preserves and natural habitat. Elegant single-family, villa and coach homes overlook miles of scenic kayak and biking trails along the tranquil Cypress Waterway. Visit our interactive Discovery Sales Center and experience this one-of-a-kind community for yourself! The Isles Club: Classic Old Florida Clubhouse • Fitness Center Resort-Style Pool, Tennis, Pickle Ball, Hiking & Biking Trails, Two Kayak Launches and 8 Miles of Kayak, Paddle Board, Catch & Release Fishing. Come explore our nature trails and waterways on Minto bicycles and kayaks! OVERLOOK BAR & GRILL NOW OPEN! Isles Of Collier Preserve Homes: Gardenia model with open situated on a .24 acre over sized Premium lot that sides up to an open space area. The home features a 2 bedroom + den with pool, spa and view of the pond. So many upgrades make this a truly special home. Every window and door have hurricane glass. Up grades include Crown molding, Ceramic tile Floors on the diagonal, Plantation shutters, Tray ceilings, Ceiling fans, Framed mirrors in baths, Window casings, Quartz counter top in guest bath, Butler pantry, Built in laundry sink, Paver bricks in pool area and driveway, Plumbed for outdoor kitchen in lanai, Shelving in the garage. New landscaping December 2018. Isles of Collier Preserve is located approx 5 miles from downtown Old Naples and beaches. The community includes a clubhouse, restaurant, resort size pool, cabanas, lap pool, fitness center, kayaking, tennis, pickle ball and many classes and activities. Low association fees. Grocery shopping and restaurants just minutes away. Isles Of Collier Preserve Homes: The true Naples’ Life can now be yours! This beautiful, well designed Gardenia model pool home is located perfectly between famous downtown Naples and Marco Island. Boasting three beds, two baths, indoor kitchen, outdoor kitchen, open concept living and being on a private lake, this home has it all. If entertaining suites you better, there is plenty of room for you and your guests in the open-concept of this home. Step into your foyer and be immediately invited in by the sites that reach all the way through your main living space to your pool. But, before you relax in your pool, be sure to grab some lunch from your open concept kitchen fit for a chef. Or, grab your favorite snack from the hidden stash in your custom outdoor kitchen. Once cooled down, head back in to your spacious master en-suite as you get ready to head to some of Naples’ 5th Avenue’s finest dining. With a short trip back home after a night you won’t forget walking back into your piece of paradise, knowing this was the one, will leave you feeling like you made the best decision ever. Isles Of Collier Preserve Homes: The first resale Fresia floor plan in Isles of Collier Preserve lies on the most desirable street with direct Western exposure overlooking the lake and forever preserve beyond. The options and upgrades were chosen with care for inspired living. The double coffered ceiling heights range between 10-13 feet with crown molding throughout. This intelligently designed floor plan has three bedrooms, study, laundry room, great room, open kitchen and an over sized covered lanai (14'X16') with covered dining area and heated saltwater pool and spa. Other options include impact windows, LED Lighting, tile throughout, plantation shutters, six inch baseboards, classic granite selections, raised panel kitchen cabinetry with crown molding. The magnificent lifestyle at Isles of Collier Preserve awaits you! Experience nature outside your doorstep and within the community. Encounter the flora and fauna of Florida on the 8 miles of hiking and biking trails then kayak the waterways all the way to the Gulf of Mexico! Isles of Collier Preserve is four miles from the beaches and shopping/dining of 5th Ave S in Olde Naples. Isles Of Collier Preserve Homes: **$50,000 buyer incentive for a limited time! ** ***Photos are of model, not home being sold. *** Beautiful Minto Mimosa floorplan. Nestled within a pristine natural setting, The Isles of Collier Preserve captures the timeless architecture and traditions of Old Naples. Over half of 2,400 acres are dedicated to lakes, nature preserves and natural habitat. Elegant single-family, villa and coach homes overlook miles of scenic kayak and biking trails along the tranquil Cypress Waterway. Visit our interactive Discovery Sales Center and experience this one-of-a-kind community for yourself! The Isles Club: Classic Old Florida Clubhouse • Fitness Center Resort-Style Pool, Tennis, Pickle Ball, Hiking & Biking Trails, Two Kayak Launches and 8 Miles of Kayak, Paddle Board, Catch & Release Fishing. Come explore our nature trails and waterways on Minto bicycles and kayaks! OVERLOOK BAR & GRILL NOW OPEN! Isles Of Collier Preserve Homes: Location,Location. This villa offers a PRIME LAKE VIEW from its spacious screened lanai & private pool. A split bedroom plan offers privacy with a third room used for bedroom or den. The home’s open/great room floor plan boasts of extensive upgrades: Impact Resistant windows & sliding doors, Salt Water-Heated pool, decorative ceramic tile and plantation shutters throughout, front door window shade, custom verti-cell shade/cornice for LR sliding glass doors, 4 ceiling fans, track lighting system in living & dining rooms, kitchen island, European style cabinets/corian counter tops, stainless appliances, both bathrooms have glass shower/bath enclosures and decorative stone wall inserts with adjustable shower handle in master bath, and quartz counter tops. Security system. Two car garage with epoxy painted floor. This Dahlia model is located in the most desirable Phase 1 close to the guarded-gate entrance and community center amenities: biking/walking trails, community pools, tennis & pickle ball courts, bocce ball, kayaking, fitness center & the new ICP-Overlook Bar & Grill. 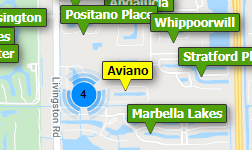 Only 4 miles from Old Naples beaches, shops & dining! Furniture available for separate purchase. Isles Of Collier Preserve Homes: V.2849 Enjoy classic coastal living on the south shore of Naples! This private villa is situated on a canal with abundant wild life in the area. This pristine well-designed two bedroom plus den home includes tile on the diagonal, custom paint, plantation shutters, stunning custom crown and entry way moldings, 6 panel solid panel doors and storm proof windows and doors. The kitchen is a masterpiece of double height cabinets with a beautiful marble backs plash and counter! Extra cabinets and two counters fill the spacious laundry room. The Master suite includes his and her vanities, walk in shower and large walk in closet. Relax in the heated pool while watching the Snook and Tarpon swim by. The Isles offers outdoor inspired amenities with large lakes and canals, for kayaking and canoeing, hiking trails, plus tennis, lap and separate resort pool, plus rustic Olde Florida waterfront restaurant called the Overlook. This home comes with a one year warranty. Isles Of Collier Preserve Homes: V.2813 This beautiful and ever popular Dahlia floor plan has both lovely lake and preserve views. Situated in a quiet location within the community, away from new construction noise, in an established neighborhood where there is pride of ownership, sense of community and views of nature. This home has numerous upgrades including custom lighting, custom paint accents, crown moldings, plantation shutters on all windows, and an electric Hunter Douglas blind to cover the triple slider going out to the lanai when needed for privacy, ceiling fans throughout, quartz countertops & ample cabinets in the kitchen, and "rain glass" on the front door and transom for privacy.In the attached two car garage, you will find a wall of white built-in cabinets. Most important, the home has a wonderful flow from the inside to the outside lanai - perfect for dining al fresco or conversing with family & friends. Did you know that the Dahlia floor plan has the largest lanai space and the largest great room in the paired villas? Last, there is a lovely spa that flows into the pool & a sitting area that is perfectly positioned to view the lake to the preserve. The Overlook Bar & Grill is now open. Isles Of Collier Preserve Homes: LETS TALK FACTS .... Seller will contribute back up to $5,000.00 toward buyer CLOSING COSTS with an accepted offer BY APRIL 30/2019... HURRY Fabulous END UNIT - you don't need to see your neighbors when you step outside to EAT, SWIM, SUNBATH, BE ALONE ;-) Super QUIET w/ easy in & out - corner unit, located at the end of the street, Wonderfully QUIET, PRIVATE & HEAVENLY !! Side of property faces the PRESERVE. Back faces the LAKE - Gorgeous Lowest HOA ever ... ONLY $314.00 per month which is INSANE - clubhouse, multiple pools and fabulous Bar/Restaurant +++ Saving the best for last .... $125K in UPGRADES that are not reflected in our super LOW PRICE $499,900.00 THIS IS AN UNBELIEVABLE OPPORTUNITY - GRAB IT !!! Isles Of Collier Preserve Homes: This popular Mimosa floor plan is the one that you will want to call home as soon as you walk in the door. Neutral tones add immediate comfort and sophistication. You will feel the WOW factor when your eye catches the stacked upper cabinets with the additional double glass door with matching interior. Upgraded 20x20 tile on a diagonal throughout the whole home provides a nice flow from room to room and easy maintenance. Sip your coffee in the morning or adult beverage in the afternoon on the extended lanai that catches all day sunlight. Community amenities include Classic Old Florida Clubhouse, Fitness Center, Resort-Style Pool, Tennis, Pickle Ball, Hiking & Biking Trails, Two Kayak Launches and 8 Miles of Kayak, Paddle Board, Catch & Release Fishing. Explore nature trails and waterways on bicycles and kayaks! THE OVERLOOK BAR & GRILL IS NOW OPEN AND FABULOUS! Need professional assistance selling your property at Isles Of Collier Preserve Naples? Find out how an Area Specialist can help to generate more property exposure in order to get the most money for your investment in the least amount of time.